On December 28, 1981, two days before his 71st birthday, gynecologic surgeon Howard Jones wrote a news release he hoped he wouldn’t have to use. The first baby created by in vitro fertilization in the United States was scheduled to be born by caesarean section that morning, and Jones and his wife, reproductive endocrinologist Georgeanne Jones, feared that the small size of the baby’s head meant a tragic defect had occurred, possibly as a result of the IVF procedure they had performed on schoolteacher Judy Carr, whose three ectopic pregnancies had destroyed her fallopian tubes. Jones left a blank space in the release for whatever anomaly had doomed the child. More than 15 years earlier, Jones had collaborated with British physiologist Robert Edwards from the University of Cambridge in England to fertilize a human egg in a cell culture dish. Then, in 1980, Jones founded the first IVF clinic in the United States at Eastern Virginia Medical School in Norfolk. But the work was controversial, with Jones and his wife under constant attack for what critics described as their unethical, morally indefensible medical experimentation. No less a luminary than Nobel Prize winner James Watson, who with Francis Crick had discovered the structure of DNA, told Edwards and Jones in 1971 that infanticide was a likely outcome of IVF. “What are we going to do with the mistakes?” Watson asked. But Elizabeth Jordan Carr, born at 7:46 a.m. that December day, was perfectly healthy, and in 2010, Robert Edwards, with whom Jones had collaborated, would be awarded the Nobel Prize in Physiology or Medicine for developing IVF. Jones, now 101, believes the recognition would have come sooner save for religious opposition. Of Edwards, who died in April, Jones notes that “the world has lost a true pioneer.” And even though assisted reproductive technologies have resulted in more than five million births since 1978, challenges to their legitimacy continue. 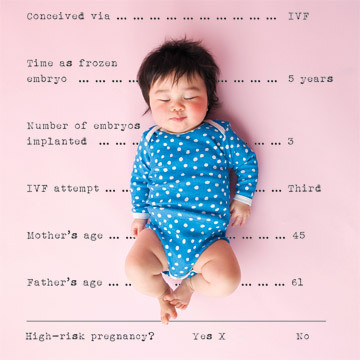 In Personhood Revisited: Reproductive Technology, Bioethics, Religion and the Law, published late last year, Jones takes on opponents who want to pass laws asserting that personhood begins with fertilization—a major threat to IVF, he says. Yet ongoing debate about IVF and other assisted reproductive technologies hasn’t kept science from further expanding the boundaries of human reproduction. Last year, two major scientific studies raised the possibility that women whose egg supply has dwindled because of age or exposure to agents that damage egg cells may one day be able to use their own stem cells to revitalize their ovaries with new eggs. That could reduce the need for IVF, and some researchers envision a time in which a woman might freeze sufficient numbers of primitive egg cells to become pregnant whenever she wants. Meanwhile, scientists have for the first time sequenced the entire genome of a fetus. The combination of having an unlimited supply of eggs and the ability to manipulate genes in utero could someday enable a couple to choose from among dozens or even hundreds of their own embryos to create a healthy, genetically desirable child. 1. Pandora’s Baby: How the First Test Tube Babies Sparked the Reproductive Revolution, by Robin Marantz Henig (Houghton Mifflin Co., 2004), May 3, 2011. Henig tells the story of the physicians who pioneered IVF and how they endured the contempt of scientists who claimed that test-tube babies would launch science down the slippery slope toward genetic engineering and human cloning. 2. “The Next (Re)Generation of Ovarian Biology and Fertility in Women: Is Current Science Tomorrow’s Practice?,” by Dori C. Woods and Jonathan L. Tilly, Fertility and Sterility, June 2012. A case for the existence of stem cells in the ovaries of reproductive-age women, a discovery that will bring stem cell–based approaches for treating infertility “one significant step closer to reality,” according to the authors. 3. Babies by Design: The Ethics of Genetic Choice, by Ronald M. Green (Yale University Press, 2007). Green lays out the future capabilities of genomic science in allowing parents to genetically modify their offspring to free them of disease and enhance them with desirable traits—raising ethical questions that should be asked now, he urges. A timeline of pivotal testosterone therapy events through history. Though routinely discarded, the placenta has a rich story to tell, full of information about fetal development and future health.